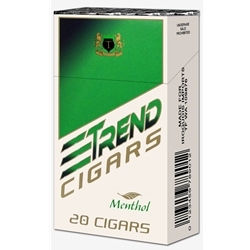 Exceptional and smooth with all-natural tastes and flavors is a great way to describe Trend Menthol Filtered Cigars. Equivalent to any major cigarette brand Trend Filtered Cigars are filled with a natural tobacco that is rich in flavor and will give a pleasant aroma and finish smooth. A great brand at an affordable price! Each carton is available in Soft 100's and packaged 20 cigars per pack, 10 packs to a carton for a total of 200 premium filtered cigars.